What does that even mean? Well, it means you can add this site's search to the drop down list of search engines. This functionality is following the open search standard. The things are actually pretty simple. You need to have an XML file <link>-ed to from your page. title="phpied.com : Search in posts"
So how do you add open search capability to your blog? 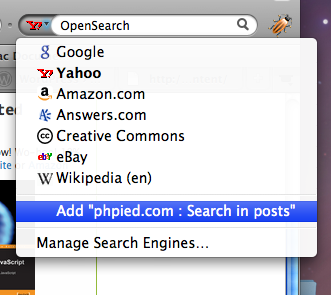 With the OpenSearch plugin for WordPress, naturally. replace all "self::" with "OpenSearch::"
And now your readers can add your search to their browser and quickly find content on your blog. Sweet.